Imagine placing an ordinary shoebox crammed full of toys, stickers, games, and toiletries into the arms of an impoverished child? Operation Christmas Child (OCC), a ministry of Samaritan’s Purse, delivered over one million such shoeboxes last year and brightened the lives of children around the world with a simple gift. We have the power to do the same. I’ve seen the beautiful OCC videos. Children beaming from ear-to-ear, little girls twirling around holding a doll, and a ragged boy clutching a box to his chest with tears streaming down his face. For a few delightful minutes, they feel valuable, they feel loved, they feel free. Free to be children and enjoy something special. The challenges of life disappear for a few precious minutes as the walls of the heart tumble down and sheer joy rushes in. To know that someone far away cares enough to reach into their pain and do something fun, practical, and beautiful touches a place deep inside, a place where perhaps no one has ever come. Today, children lie in hospitals and homeless shelters, orphanages and unhappy places all around us, children not necessarily hard up financially but physically and emotionally destitute, needing a lift of the spirit. Maybe they just got the test results. Or heard the court order. Or got more bad news. 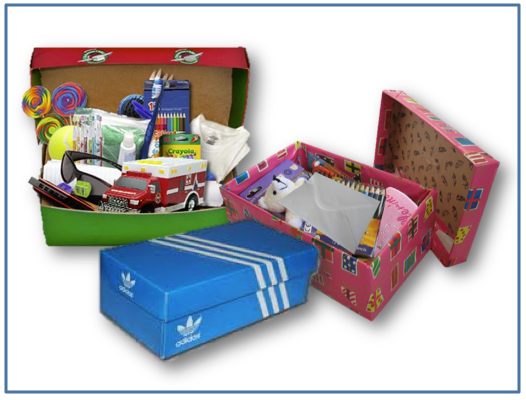 Any day can be a shoebox day for a hurting child. I wish I had been more sensitive to all of this earlier in life. After walking my path, I sometimes catch myself going back in my mind to the patients I’d cared for, all of the things I could have done but didn’t. I don’t stay there but focus instead on what my family and I can do today to help families going through a difficult time. One little shoebox is all it takes. I’ve posted a list of TEN SHOEBOX PACKING ITEMS I’ve started with in the past. For more great ideas, please visit SamaritansPurse.org.